Great food, great friends, great dressing, and the party is on! In keeping with the Harris Family tradition, we’ve created a light delicious dressing with vibrant flavors and an abundance of uses. Toss onto your favorite salad or use as marinade for grilling. We invite you to share in our delight by experiencing Lemon Garlic Vinaigrette for your next meal. Get your bottles today by either stopping by the restaurant or calling us at (509) 933-3330. 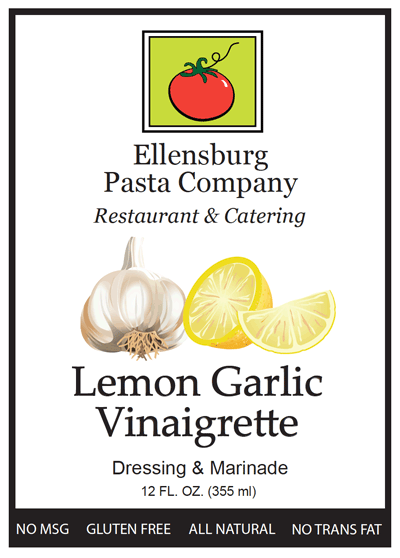 EPC’s Lemon Garlic Vinaigrette is made in the Pacific Northwest with all-natural ingredients and contains no MSG, gluten, or trans fats. Ingredients include canola oil, brown sugar, vinegar, water, lemon juice, and garlic. And each 2-tablespoon serving is only 130 calories (each 12-ounce bottle contains 12 servings). Do you have an old kitchen or cookout standard that needs some spicing up? Our Lemon Garlic Viaigrette makes the perfect foundation for basting meat, poultry, seafood, or vegetables before cooking as well as a marinade to tenderize and flavor ingredients. Let imagination guide your experiments. Or try one of our favorite recipes refined by Bruce over the years. Combine all ingredients in a bowl. About 10 minutes before serving, drizzle and toss with 2-3 ounces of Lemon Garlic Vinaigrette to preferred taste. Place bowl in the refrigerator for 10 minutes before serving. Try using what you have in your crisper drawer! Bell Peppers, onion, or asparagus. Beets work well in place of strawberries and blue cheese crumbles can be substituted for the feta. Add grilled chicken breast or shrimp and you have a complete meal!